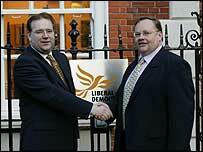 A senior aide to Steve Norris, the Tory candidate for London mayor, has defected to the Liberal Democrats. Deputy campaign director Edward Lord said he was resigning because he no longer had any faith in the Conservative party with Michael Howard as leader. He described the new leader as "an unreconstructed authoritarian; uncaring, unfeeling". He said his decision was not due to the row over Mr Norris accepting the chairmanship of contruction firm Jarvis, although he did say that action had been "regrettable". Jarvis faces an investigation into its maintenance of the railway track at Potters Bar, scene of a fatal crash last year. Mr Norris became interim chairman on Tuesday, but is expected to quit the company if he wins the 2004 mayoral election. Mr Lord, 31, said he was disappointed at the appointment of Michael Howard's as Conservative Party leader. In his letter of resignation, he said: "Despite the removal of Iain Duncan Smith's malign influence, the Conservative Party shows no sign of changing. "I can summon no enthusiasm for the leadership of Michael Howard who remains an unreconstructed authoritarian; uncaring, unfeeling and determined to suppress individuals' civil rights to conform to his moral doctrine." Mr Lord joined the Norris campaign earlier this year, but now says it will be difficult for the Tory candidate to unseat the current mayor. "This is a race now between Ken Livingstone and Simon Hughes", he told BBC London. "The difficulty with Jarvis has made it impossible for Steve to make a breakthrough." The Liberal Democrat candidate for mayor, Simon Hughes, said he was delighted by Mr Lord's decision to defect.